Graham Brown is a Vancouver based roots rock veteran honing his craft over an incredible 20 year discography that spans several cult bands (Jr. Gone Wild, Brilliant Orange, Happyman), major labels (BMG, A&M), coveted indies (Zulu Records, Not Lame), and incredible reviews from roots/Americana media around the world. At the legendary Cavern Club, Liverpool, Graham was the highlight of a Bongo Beat showcase and garnered rare praise and a live broadcast over BBC Liverpool with noted DJ/writer/roots music historian Spencer Leigh. The prestigious Americana.UK site gave this album 4 out of 5 stars ("There's good songwriting and playing here and the album as a whole has an effortless sound to it"). Rootstime (Belgium) namechecks Crazy Horse, Nick Lowe, Dave Edmunds and Rockpile in its 4 1/2 star review (out of 5). Graham's grit-fueled harmonica, concisive guitar work and hook laden songwriting are this year's revelation in Americana. 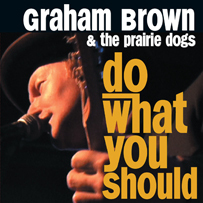 For 2010, Graham is touring across Canada and Europe with his rough-hewn band of Prairie Dogs; tearing up the landscape with his patented brand of Western Canadian fervour.